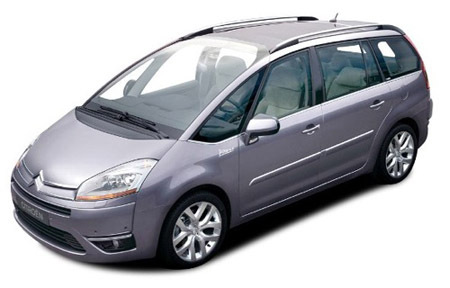 Citroen vehicles make for a great 7 seater car rental for families planning their next holiday. Let’s take a closer look at the Citroen C8 and Citroen C4 Picasso and see whether they’re the right rentals for you. Although this Citroen vehicle shares many traits with other European vehicles, this vehicle was designed to accommodate families on the road. It boasts a more car like performance than similar models, capable of cruising speeds, and feels rather smooth and swift for a car of its calibre. The C8’s best asset is its large cabin, which provides a lot of room for all occupants who ride in this vehicle. The rear most seats, however, don’t provide enough boot room, and instead just empty unshielded space that might pose a little of a problem. Still, there’s plenty of luggage space in this vehicle, as long as you fold up the passenger seats, storing them upright, to make more space. There are also plenty of other storage spaces located under the seats, in the doors and around the dash assembly. The climate control is separated for rear and front passengers, while there’s also sun blinds in place to keep the sunlight out of people’s view. Not only that, the luxurious build of this vehicle makes it so everyone will feel comfortable while travelling long distances. Although large and tall, this vehicle is comfortable for drivers to handle on the road. It boasts a great performance, especially if driving the 2.2-litre diesel C8, as it feels responsive and stable when in use. And, if you’re concerned about safety, this vehicle has a five-star crash test rating, and includes a variety of safety systems to make this ride feel that much more safe and sound. Though a little older, the Citroen is a distinct upgrade from the Xsara Picasso, having had upgraded various quality of life features. The C4 Picasso offers a lot of space in between the front seats, while the largest amount of leg room in the vehicle cabin resides in the second row. 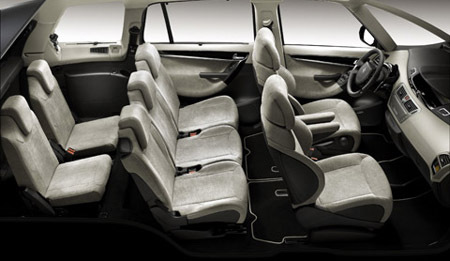 Not only that, there’s plenty of room to adjust the seating into various configurations, so you don’t have to stick with the standard 7 seat layout. There are also plenty of storage bins and cubbys for those families that need additional space—interestingly enough, there’s also a refrigerated cubby for those who want to hold drinks for the long ride. The comfort factor of this car is high—there’s air conditioning in most models, with the top spec versions featuring dual zone automatic air conditioning and even air quality sensors. The car also produces very little noise and vibration, and is well protected against any sort of exterior winds and noise, including engine noise. Drivers will like the diesel variants much better than the petrol versions. The diesel variants run better and much more comfortably than their petrol counterparts. All models, however, have responsive steering and a tight turning circle that makes driving relatively smooth. This car is well suited for families, particularly if they’re looking for a rental vehicle for a long holiday trip. Child seats can be fitted to each seat in the second row, while still providing enough space for everyone else. There’s also an optional flatscreen DVD player in the second row, affording both children and adults some entertainment on the long ride. The Citroen C8 is an excellent choice for those who want a large, tall and safe vehicle for travelling with the family. It has an all around good performance and its five star safety rating only adds to its reputation. The Citroen C4 Picasso is reserved for those parties who want a ‘higher tech’ vehicle with enough space to house a family. There’s enough room to accommodate a young family, especially if they need to use child seats and the entertainment options only add on to that accommodation. All in all, both vehicles represent good choices when you need to hire a 7 seater.